Statement made by Gary Hinman’s cousin, Kay Martley, at Bruce Davis’ 2014 first parole hearing. Good morning. I appreciate my opportunity to speak on behalf of a member of my family who cannot speak for himself. My cousin, Gary Hinman, was a musician who left his home state of Colorado to live and work as a musician in the Los Angeles area. Gary was kind and outgoing. He was a good-hearted person who often gave others in need of a place to stay for a few days or a few dollars to get by. Gary’s charity is what led him to be befriended by the wrong kind of people, the kind of people who tortured him for several days before killing him. And Bruce Davis was among that group of people and that group of people is now better known as the Manson family. Everyone knows the Manson family is responsible for the murders of Sharon Tate, her friends, the LaBiancas, Shorty Shea and others who had the misfortune to be in the wrong place at the wrong time. I’m here to speak on the behalf of our family and remind this Panel of the devastating impact Gary’s death had and continues to have on our family. Even Gary’s death hasn’t gotten the same kind of publicity. Gary’s mother died only a year after Gary’s murder at the age of 61. We watched the stress and grief eat away at her until it killed her. Gary’s sister, Carol, can barely bring herself to talk about what happened to her brother. She remains afraid even now to speak out for fear of retribution from other Manson followers. Over the years, Bruce Davis’ story about the level of his involvement, his actions, his culpability has changed constantly. He has never shown remorse, taken accountability or tried to apologize to any member of my family. At Mr. Davis’ last parole hearing, he represented a letter from someone named Renee Riley, which apparently they didn’t check on the veracity of it, who she doesn’t belong to our family nor has anything to do with us. Neither Carol, Gary’s sister, nor anyone else in our family know who this person is or gave her permission to speak on the behalf of the Hinman family. However, I have traveled 1500 miles to come here today. I am a member of the Hinman family. I grew up with Gary and I’m here to tell you that Gary’s murder has a lasting impact on our family. Every time Mr. Davis comes up for parole, the surviving members of Gary’s family must relive the horror of his death. These people held Gary captive in his home, stabbed him, cut off his ear, tortured him over a period of three days. When they found him, the carpet was soaked with Gary’s blood. The walls were covered with Gary’s blood. There was — this wasn’t a crime of passion or impulse. This was slow and calculated and cold-blooded. This is what Bruce Davis did. The problem is you can’t undo a murder. You can’t undo the death of a mother over her son. You can’t undo the paralyzing fear that a sister lives with on a daily basis. You can’t undo the empty space in a family where a living, breathing person once was. Above all, you can’t change history. But that’s exactly what Bruce Davis wants you to do. He wants you to forget that he’s a mass murderer. He wants you to forget that he’s alive today and Gary Hinman isn’t. He wants you to look past the fact that he learned to manipulate the system and misrepresent Renee Riley’s letter as being from someone in the Hinman family, when in fact the murder victim’s family have never heard of her. He wants you to think he’s rehabilitated when he’s never taken any kind of responsibility for his actions to the family that has lived with the results of his action. I ask you today for justice for my cousin, Gary, and all the other victims from the Manson family. I do not believe in revenge, but I do believe in justice. Because of the nature of the crimes committed by Mr. Davis, and the severity of them, because he’s never shown remorse or taken responsibility, Mr. Davis should remain in prison for the rest of his life — for the rest of his life — which was a lot more than my cousin, Gary, got. When a punishment is handed down by a court or jury, it should be fulfilled. Thank you. 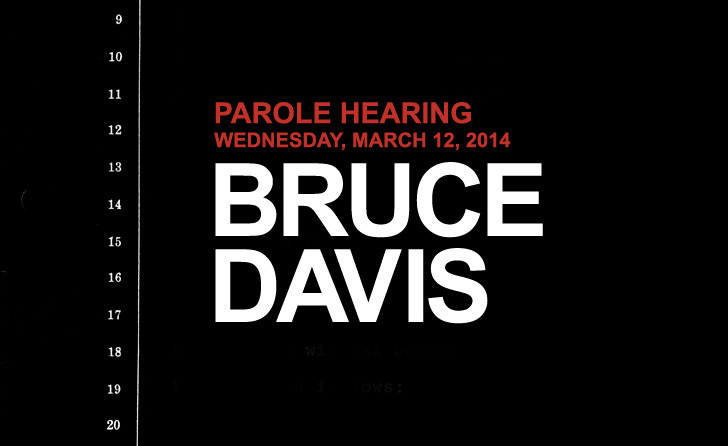 Bruce Davis should receive parole. Bruce is a sincere Christian. It really is time to heal, when the release of any person who has served their time and is fit to live in society. Healing can only come with forgiveness. Gary Hinman would be the first to say its time to let go and release these people. they are all scumbags who brutally murdered individuals without compassion. they should all rot in prison.